They were the movers, the shakers, backslappers and opportunity-seekers, all cheerleaders for progress as long as nothing really changed. 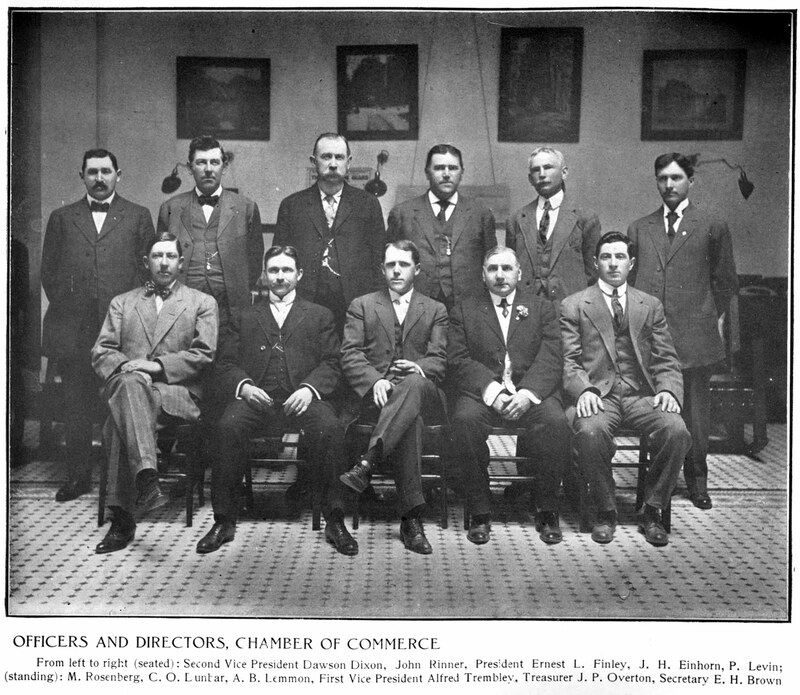 They were the members of the 1909 Santa Rosa Chamber of Commerce, and Press Democrat editor Ernest L. Finley was their president and the town's Booster in Chief. To an outsider, it might have seemed as if the Chamber was much ado about not much except for their annual membership dinner. It was civic groups such as the Woman's Improvement Club that organized the Rose Carnival and other projects that made Santa Rosa a nicer place to live, and the Sonoma County Automobile Association - led by James Wyatt Oates - lobbied for first-ever street paving and other needed infrastructure upgrades. On the flip side, we do have the Chamber mostly to thank for the 107-page "Illustrated Portfolio of Santa Rosa and Vicinity," which served to beautifully promote the town and remains the most valuable photographic artifact about Santa Rosa from that era. But what the Chamber also sought was to silence critics of the status quo. Boosterism has a long history in America, going back at least as far as the early 19th century drive to promote Chicago as the commercial hub of the westward expansion. By the end of the 1800s, towns everywhere were puffing up about their specialness to attract new businesses and residents. But the term "knocker" apparently didn't appear until around 1906*. It quickly devolved from simply meaning someone who didn't sufficiently boost their town into describing someone who was sabotaging the community, and within a few years, to be a knocker was to being labeled a pariah. A 1910 magazine offered a booster/knocker checklist (which was reprinted in other journals) that included venom such as, "The booster is a loving husband. The knocker is a wife beater..."
Lea's speech was rich in willful ignorance or hypocrisy. 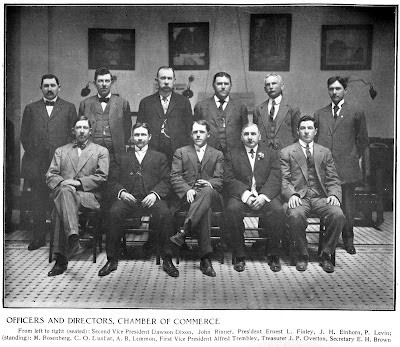 The very men in his audience were the ones who were actually fighting progress and change; just a year before, they had won the 1908 city elections with a keep-the-status-quo ticket headed by the Chamber's previous president, defeating a coalition of reformers who wanted to weed out Santa Rosa's entrenched corruption. The attendance list for the Chamber's dinner (CLICK or TAP to enlarge) is also interesting for who did not attend. Missing were James Wyatt Oates and John Comstock; Oates' absence is not surprising because he had no truck with the Good Old Boy clique that made up most of the Chamber, but Comstock might have been expected to attend, as he and his sisters had recently opened an art gallery on Fourth Street. Also MIA was Luther Burbank, who always stood with the reformers - even as he permitted the Chamber to endlessly tout his name and image to boost the town. The Press Democrat account of the dinner also includes a detailed description of the 1908 nickelodeon film made about Burbank, which is now presumed lost. A later short, "Nature Study," was produced by the Ford Motor Company ca. 1917 and is widely available. *Google Books shows "knocker" being used between 1901-1904 to criticize trade union members who didn't support their union. ...During the enjoyment of the feast the large orchestra, under the direction of Mrs. Joe P. Berry, rendered a number of selections from the balcony. The music was a fine feature and the spontaneous applause of the auditors showed their appreciation. It was a bounteous spread of everything and all concerned earned many compliments for the excellence of the arrangements. ...Horatio F. Stoll, secretary of the Grape Growers of California, had a very entertaining address. His topic was "Our Experiences at the Seattle Exposition," dealing with the manner in which the California exhibit and "boosting" was received at the exposition. He said some very good things along the line of future promotion effort. A most interesting part of his remarks was their illustration by a set of excellent views and moving pictures, in which Santa Rosa and Sonoma county were particularly brought to the front. A complete set of these pictures is being shown at the great Irrigation and Land Congress now in session in Chicago. The pictures created a great deal of enthusiasm at last night's assemblage. They showed the Luther Burbank residence on Santa Rosa avenue; Mr. Burbank coming out of the door and starting to work in his experimental grounds; his reception of visitors and other interesting features. One of which Mr. Burbank's aged mother, who comes out and seats herself on the porch. Mr. Burbank's secretaries, Miss Pauline Olsen and Miss Swanson. The other picture reproduced the great Italian-Swiss Colony at Asti, Sonoma county; the vineyards and wine-making; the Sbarboro Pompeiian villa and Mr. Sbarboro receiving visitors with the accustomed genuiness [sic] of California hospitality. After the proceedings were over men and women lingered to discuss the success of the evening in all its varied forms. One could not help remarking what an eye-opener it would have been for an easterner, coming from his November frosts and snows, if he could have looked in upon that festive scene in Native Sons' hall and viewed those magnificent chrysanthemums, roses and carnations that had been plucked a few hours previously from their blooming in the open air i;n the gardens of the "City of Roses."